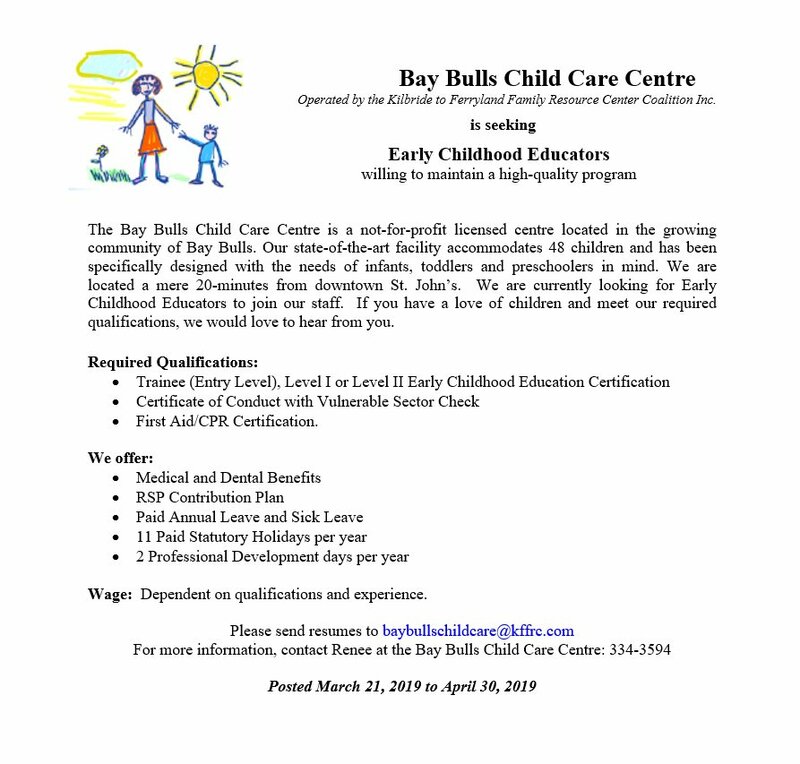 Our organization offers a licensed child care center in Bay Bulls, just 15 minutes from St. John's. The Child Care Center is located in the "Regional Lifestyle Building" on Cemetery Lane West. The facility has been specifically designed for a child care center, with the needs of infants and toddlers in mind. Our center currently offers full-time care for infants (0-24 months), toddlers (24-36 months), and preschool children. We employ 16 staff and have a capacity for 46 children. Our philosophy is based on the knowledge that children learn through play. Play develops physical and intellectual skills, promotes emotional health and creativity and helps children learn to get along with others. Opportunities for exploration, discovery, creativity and experimentation are provided on an ongoing basis so that children can learn to grow by their own efforts and at their own developmental pace. Quality child care services promote healthy early childhood development when they focus on the child's age, abilities and needs. Family Resource Programs, however, look beyond the child to support families in many other aspects of their lives. Our vision is to create a quality child care program that would also link families to the family supports available through the Family Resource Center. Programs such as the Toy Library, Parent Resource Library, Parent Education Programs and many other programs for parents and children. The possibilities are endless. For more information on the Child Care Center, please call 334-3594 (Ext 2) or email baybullschildcare@kffrc.com.